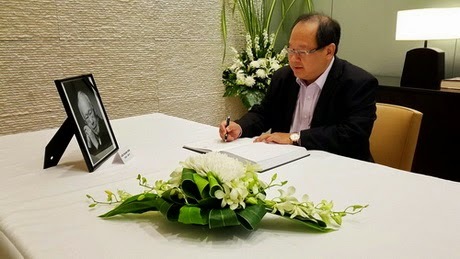 IN MEMORY: Sunday Star columnist Roger Tan paying tribute to the late Singapore founding father Lee Kuan Yew in the condolence book at the Singapore High Commission in Kuala Lumpur. Spontaneous and emotional outpouring of grief by Singaporeans is indeed a testament to Lee Kuan Yew’s extraordinary achievement in creating a united nation out of a divided, polyglot, multi-racial and multi-religious population. THE fact that today our Yang di-Pertuan Agong will represent Malaysia at Lee Kuan Yew’s funeral – an epochal event in the history of Singapore – speaks volumes of the island’s founding father as the greatest statesman in South-East Asia. In fact, President Richard Nixon held him up as a leader of similar stature as Winston Churchill. Most importantly, Lee was also instrumental in the formation of Malaysia and hence he and a generation of Singaporeans were once, albeit briefly, Malaysians between 1963 and 1965. Born on Sept 16, 1923, Lee read law at Cambridge University and obtained a starred double first and started practising as a lawyer in 1950 for almost a decade. As a legal assistant, he took up cases for trade unions, often on a pro bono basis. This undoubtedly helped him later to generate mass support for him when he became prime minister in 1959. Almost half a million Singaporeans have already turned up at Parliament House and the 18 community tribute sites to pay their last respects to the nonagenarian. Thousands more did not mind queuing for up to 10 hours the night before in order to reach the Parliament House where the body is lying in state. This spontaneous and emotional outpouring of grief by Singaporeans is indeed a testament to Lee’s extraordinary achievement in creating a united nation out of a divided, polyglot, multi-racial and multi-religious population. It is ironic that someone who had believed in Machiavelli, making him the most feared person in Singapore, is now someone who is most loved by his people. It is understandable that Singaporeans’ biggest regret is that their founding father would not be there on Aug 9 for their 50th national day celebrations. Lee was indeed a great leader in every sense of the word. He was humble enough to say sorry if he was wrong and if it was in the best interest of his county to do so. Hence, he had apologised to Malaysia a few times for some of his acerbic comments. He was also a first-class diplomat whose advice was often sought by leaders of superpowers even though he was just the head of “a little red dot” on the world map. In one particular incident, two Indonesian marines were executed in 1968 for the MacDonald House bombing which killed three people, despite a plea for clemency from President Mohammad Suharto. Suharto vowed to teach Lee a lesson, and the Singapore embassy was almost burnt down. But Lee pulled off a diplomatic coup during his visit to Indonesia in 1973 when he took time off to visit the graves of the two marines. With that, bilateral relations between the two countries improved. Today, President Joko Widodo is also at the funeral. Former Indonesian presidents Susilo Bambang Yudoyhono and Megawati Sukarnoputri (President Sokarno’s daughter) and two daughters of Suharto had also paid their respects to Lee. Lee was not without critics who accused him of being ruthless in detaining his political opponents and secret society gangsters under preventive laws. To the brilliant lawyer, the rule of law means laws must reflect reality and be capable of governing human relations and maintaining order. Laws should not be applied blindly and they should be changed and adjusted if they do not serve societal needs even if they are against individual liberties. In his view, there should be radical departures from the English patterns due to sociological and political conditions. Lee made no apology about taking his political foes to court for libel and bankrupting them. He said his foes were entitled to do likewise but they could not because he would not libel them. He also did not mind being accused of interfering in the personal lives of his citizens from cradle to grave or womb to tomb, and even in the bedroom! He said he did it without any compunction, otherwise Singaporeans would not have achieved any economic progress. One of the most controversial policies was the two-child policy which he later admitted might have been an error. Women graduates were upset too when they were told that they should not remain single because intellectually and financially they were in the best position to breed talent. Having said that, he should be credited that his social engineering laws did manage to change the social habits of Singaporeans to First World citizens, not like “Third World citizens spitting and littering all over the place”. He said bluntly, “Mine is a very matter-of-fact approach to the problem. If you can select a ­population and they’re educated and they’re properly brought up, then you don’t have to use too much of the stick because they would already have been trained. To my mind, Lee’s biggest legacy is in fact his protection of minorities and zero tolerance for corruption. Even though the Chinese form 75% of the population, he did not practise majoritarian demo­cracy. Article 152 of the Singapore Constitution provides that it is the responsibility of the government to constantly care for the interests of the racial and religious minorities, particularly the Malays whose special position is recognised. He modified the one-man-one-vote system by creating group representation constituencies (GRC) whereby each GRC can return three to six MPs, but one of whom must be from the minorities (Malay, Indian or other minorities), thereby ensuring that they are represented in Parliament. In this sense, to Lee, it is impossible to achieve equality among men. It is not a reality, only an aspiration. It is, therefore, meaningless for the American Constitution to declare “we hold these truths to be self-evident that all men are created equal” when the blacks are less than equal. It was also his view that it would be undemocratic for an elected representative to jump ship after he had been elected. In Hard Truths To Keep Singapore Going, he wrote: “We have built up a democratic system which suits us. In a liberal democracy, a man, once elected, is free from all party discipline. You have that in Singapore, you have unstable government. So we didn’t say you cannot change sides. You can. But to join the other side, you vacate the seat and face a by-election. That prevents these musical chairs. Today, Singapore is one of the most corrupt-free countries in the world with the third highest per capita income in the world. His zero tolerance against corruption and obsession with good governance have obviously contributed to this success story. His other indefatigable con­tri­butions to his country include making Singapore today to be self-sufficient in treated water by increasing from three reservoirs in the 1960s to 17 reservoirs today, including the Marina Barrage. He spent 10 years in transforming the Singapore River from an open sewer to a clean and natural river. His bilingual policy and making English as the administrative language have placed Singaporeans in good stead without sacrificing their individual cultural identity. His Speak Mandarin campaign has also brought together the Chinese of different dialects passed down by their coolie ancestors. He suffered no fools, and was prepared to pay highly multi-­talented ministers, judges and civil servants of unflinching integrity. All in all, whether you like or dislike him, it cannot be gainsaid that he is synonymous with Singapore. Without him Singapore is not what she is today. Singapore will not “kaput” after his departure because of the strong foundations which he has left behind and if his successors will have the same gumption, foresight and creativity to face the challenges ahead of them. His passing is not just felt by Singaporeans alone, but by many Malaysians especially those from Johor to Malacca who are able to receive Singapore radio and television transmissions. Indeed, more than half a million grateful Malaysians work and study in Singapore and have benefited tremendously from Lee’s policies and scholarships, including my own family members. As Lee put it, we are people “connected by geography, economics and ties of kinship”. Rest in peace, Mr Lee, and hereafter may you be reunited with the one you loved most, your beloved wife Kwa Geok Choo.